This is Part 2 of a 3 part series. Part 1 talked about the Functional Aspects of Optimizing Your Blog and Part 2 talked about the Technical Aspects of Optimizing Your Blog. 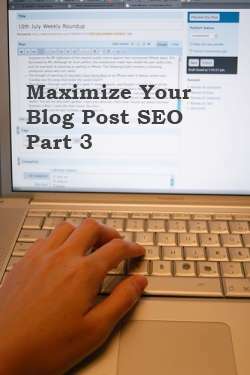 This post is about effective linking strategies to optimizing your blog posts for SEO. The phrases that I’ll use for blogging refer to working with a WordPress blog but you can adapt this to any other blogging you’re doing. The terms links and backlinks get thrown around a lot but that doesn’t mean that they’re understood. To make sure we’re all on the same page, I’ll give you my quick definition. Links refer to any hyperlink or clickable link from one website page to another like the links you see in my first paragraph. Backlinks refer to any links on another website that are pointing to your site. An example of this would be when you send this blog post link out on Facebook. Is that somewhat cleared up? For this post we’re just going to talk about links within your own website. I find that this is an often overlooked aspect of linking but an effective on-site linking strategy can dramatically increase your traffic and usefulness to your visitors. Below we’ll talk about the different ways that you can link within your site for better blogging results. Before we can get too much further, we have to talk about the “anchor text” of the link. The anchor text is the actual words that are hyperlinked. An example would be a link to our Detroit SEO services. The anchor text for that link would be Detroit SEO. It’s important when selecting anchor text to make it readable and more of a useful link for your readers as well as placing good keywords. A link to Detroit SEO is much more readable and useful than “here”, “link” or “click here” and it’s not spammy anchor text that tries to cram every keyword in. One of the easiest ways to give you new blog posts a boost from the search engines and from visitors to your site is to showcase your most recent posts on the home page. Not only does this give visitors refreshed and recent content that they can click on and read, it also does two things for the search engines. First it gives you fresh and unique content on your home page, which search engines love, and second it gives you a link from the page with the most authority on your website back to your blog post. This link passes on authority to your blog post, which helps give it a boost in the search engine rankings. If I’m writing about a subject and I know I had a great post in the past that explains part of it or is related, shouldn’t I link to it? Not only is this helpful to the visitor, who may want to read about that other subject but it is great for search engine optimization. Each link, with proper anchor text, is basically a vote for that post. The more links into a post, the more authority it has, and the easier it is to rank. When you link to an older post, you’re continuing to build its authority or to refresh its status with the search engines. Google has been selective on what it will index nowadays and if your post is older, it may not even be indexed. Linking to it could give it the boost that is needed to get it indexed again. This is a method that you don’t see used as much by newer bloggers. Once you’ve been blogging for awhile, you’ll find that you have some blog posts that get a lot of good traffic and have more authority in the eyes of Google. You need to take advantage of that! When you’re writing on a similar topic as an older post, you have an opportunity to give your new post a good boost. By linking to newer posts from your older, high authority posts, you can give them a much better chance for rankings and traffic. A good way to do this is to check your Google Analytics every couple of months to see what posts are getting a lot of traffic on your site. Go to those posts and then identify newer related posts that you can link to with good anchor text already found in your old post. In this way you’re capitalizing on the success of your older posts and open it up for the search engines and visitors to find your new, related posts. While I might have thrown quite a bit at you today, the key points are this. Create links to other posts on your site for both your readers and search engines. Don’t spam! Make sure that you select anchor text that makes sense to the reader and let them know about related posts that can give them more information on the subject. What questions did we leave you with on this series?